It’s a criminal offence to be impaired while driving. Not only intoxicated by alcohol, but the offence also refers to people having care or control of a motor vehicle while their ability to operate the motor vehicle is impaired by a drug. Impaired driving is punishable under multiple offenses in the Criminal Code. The penalties vary depending on the harm that is caused by the impaired driving. In addition to driving while intoxicated by alcohol prior to any type of surgery that requires anesthetic, the best option is to arrange for transportation home. This includes driving after any dental procedure that involves anaesthesia or sedation. Anaesthesia can slow re ex and thought process. After a person has been under anaesthesia they may feel like themselves, however their ability to drive and their judgment may be severely hampered. When someone cannot drive safely due to medications, physical limitations such as lack of strength, or could get injured because of orthopedic surgery – like a hip replacement – using Keys Please® is a better and safer option than driving. Plus, with Keys Please® there’s the convenience of a person driving to their appointment and Keys Please® driving him or her home in the comfort of their own vehicle. In 2015 Keys Please® supplied service to approximately 90,000 people in Calgary. 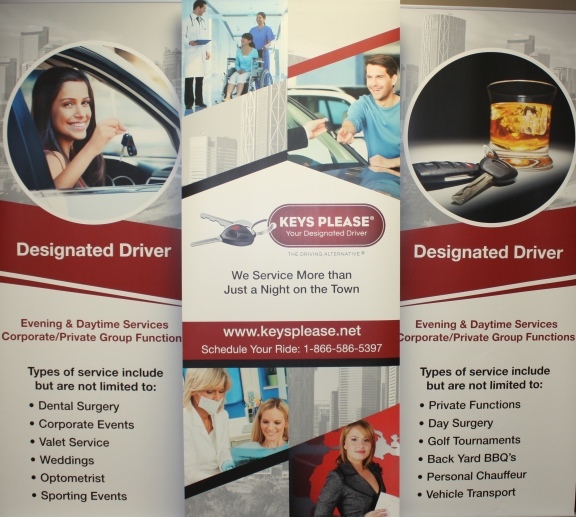 Now with a large number of customer requests to extend services into Airdrie, Okotoks and Chestermere, Keys Please® is excited to announce that effective February 19, 2016 Keys Please® provides designated driving services for those cities. is available to the rider, showing vehicle on route to pick up location and vehicle on route to drop off location. There are CCTV cameras in all PFHV (for the protection of drivers and customers). For more information visit www.keysplease.net.